A track of 750 meters long and 8 meters wide with the illumination needed to enjoy the Karting day and night. Una pista de 750 metros de longitud y 8 metros de ancho con la iluminación necesaria para disfrutar del Karting de dia y por la noche. 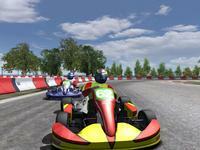 There are currently no setups for Karting Cardedeu. Add a Setup. Thanks for this and for the sudden exciting flurry of activity. lo siento por las molestias si usted sabe si alguien ha hecho Zuera, donde se diKF3 la copa del mundo? The real Karting Cardedeu looks like a very nice kart track. It doesn't look bad in rFactor, except from a couple of things. The track is made from straight lines connected to each other, instead of a smooth line. Karting Castelloli has the same problem. It is not only the track, but also the racing line, which makes the AI karts drive like they are drunk. In Bob's Track Builder it is possible to smooth the shape of the track and the racing line. I don't see much green surrounding the track, I see a picture from Google Earth shining through. And the track camera's are very high in the air, which doesn't look very natural to me. If these things can be fixed it is a very nice rFactor kart track.